Lepista saeva, the Field Blewit, differs from its close relative the Wood Blewit in having a cap coloured greyish brown to beige rather than violet even when young; its preferred habitat is calcareous grassland, although occasionally this chunky and conspicuous mushroom can be found also in woods. Field Blewits rarely fruit alone, and it is not unusual to find them in fairy rings or in groups huddled together so that their caps are touching. 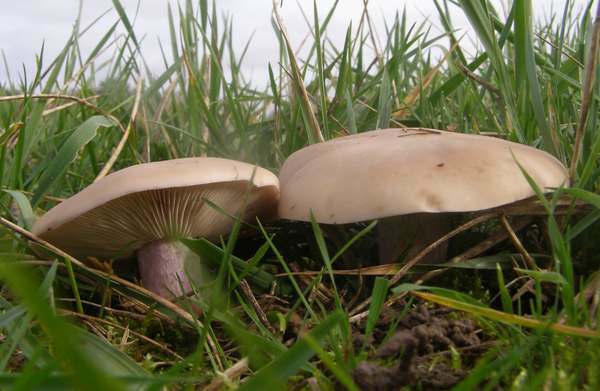 Fairly common and widespread in Britain and Ireland, although not seen as frequently as Lepista nuda (the Wood Blewit), Field Blewits are found throughout most of mainland Europe. In common with Wood Blewits, Field Blewits are also reported from North America, and some field guides published in the USA now - Classify them as Clitocybe saeva. This mushroom was initially described named Agaricus personatus by the great Swedish mycologist Elias Magnus Fries in 1818, at which time most gilled mushrooms were lumped together in the general-purpose Agaricus genus most of whose contents has since been distributed across many new genera. Mordecai Cubitt Cooke renamed this mushroom Lepista personata in 1871, and almost a century later, in 1960, English mycologist Peter Darbishire Orton gave it the name Lepista saeva, which is the scientific name in current use (at the time of writing these notes in 2012) in the Kew Gardens and British Mycological Society checklists. 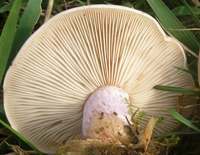 Synonyms of Lepista saeva include Agaricus anserinus Fr., Agaricus personatus ß saevus Fr.,Tricholoma personatum var. anserina (Fr.) 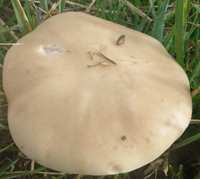 Sacc.,Tricholoma personatum var. saevum (Fr.) Dumée,Rhodopaxillus saevus (Fr.) Maire, and Tricholoma saevum (Fr.) Gillet. 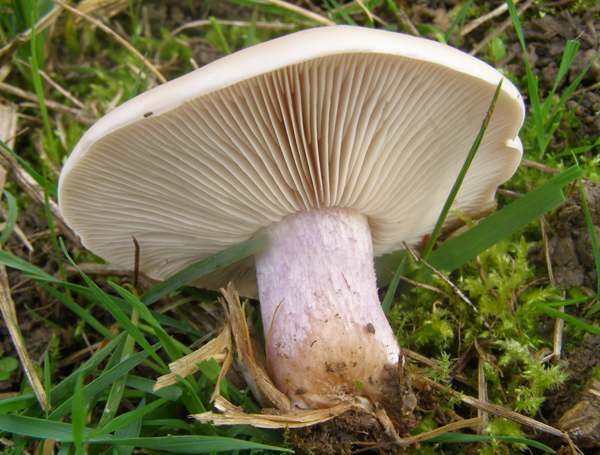 The synonym Clitocybe saeva, proposed by Howard E. Bigelow & Alexander H. Smith in 1969, is preferred by some authorities and particularly so in the USA. Lepista is derived from Latin and means a wine pitcher or a goblet, and when fully mature the caps of Lepista species do indeed become concave (sometimes referred to as being infundibuliform) like shallow chalices or goblets. The specific epithet saeva means savage or fierce, but why a Field Blewit should be considered fierce is a mystery; however, 'wild' seems rather more appropriate. 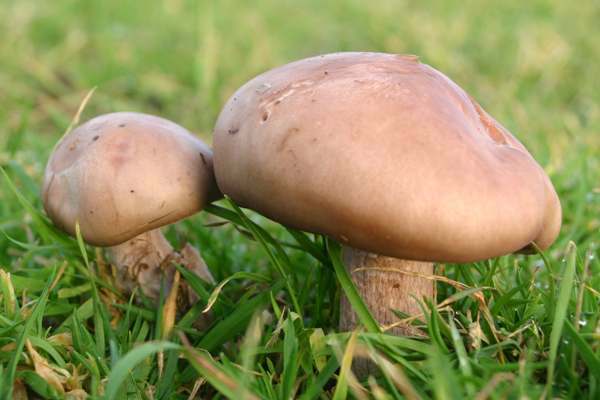 The smooth cream to buff or light brown cap, up to 15cm in diameter, is initially domed and has an incurved margin, but older specimens may become slightly concave and sometimes develop wavy cap margins. Sinuate to free and crowded, the gills are almost white when young, turning pinkish buff as the fruitbody matures. 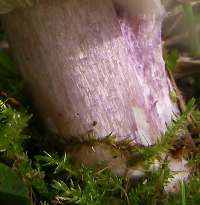 15 to 25mm in diameter and 4 to 6cm tall, the purple-flushed fibrous stem is solid and sometimes slightly bulbous at the base. Strongly perfumed and with a pleasant taste. Saprobic, growing most often in chalk or limestone grassland; occasionally in woods on calcareous soil; often producing fairy rings. Most plentiful from September to November but sometimes seen through to January in southern Britain and Ireland during mild winters. Lepista nuda, the Wood Blewit, is an even more common species; it is very similar but has a violet tinge to the cap and gills. Some Cortinarius mushrooms have blue stems and brownish caps; they grow in woodlands rather than in open fields, however. Field Blewits are rated as good edible mushrooms as long as they are well cooked; however, they can upset some people's stomachs, so it is important to try only a small sample initially. They have firm flesh and a slightly nutty flavour. In many parts of mainland Europe both Field Blewits and Wood Blewits are available in supermarkets - sometimes the two species packed together as Pied Bleu or Blue Legs - throughout most of the autumn and early winter months, and they are particularly popular in France, spain and Portugal. Young caps are best, but the stems are tougher than the caps and are probably best dried, powdered and saved for making soup.